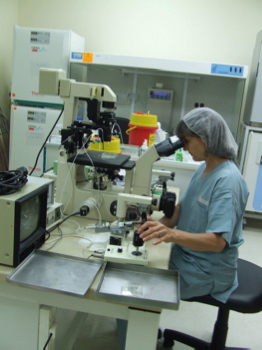 IVF.net - Air Quality in IVF laboratories is far more critical than in any other medical room. Air Quality in IVF laboratories is far more critical than in any other medical room. Growing embryos can be very frustrating. Sometimes we just can't find any logical explanation why rates of success are dropping. Embryos are extremely sensitive. A deep concern should be involved when they are exposed to lab environment. VOC - is responsible for lack of success during the first years of any lab life. "Off-gas" process along with a proper ventilation pattern could dramatically reduce the negative effects of VOC on embryo survival. Ultra Violet Radiation: fluorescent lamps, the microscope lamp, sun light are all "contaminated" with UV light spectrum. UV is an excellent disinfectant, but we do not want to disinfect our embryos... Replacing the lamps with truly "UV free" lamps can solve this problem. CO2 quality: compressed gases contain dangerous levels of organic (VOC) contamination. Use of pre –filtered CO2 VOC free, is essential. Magnetic flux: Is probably responsible for many failures in the" In vitro fertilization" process. Modern equipment contains heavy electronic circuits. 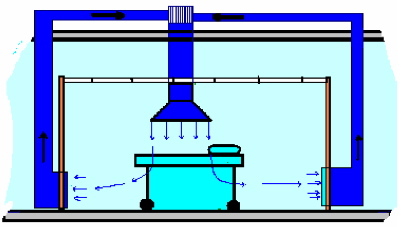 Electronic heaters and fans increase dramatically the magnetic flux in incubators and on laminar work stations. Studies showed that embryos in their first 24 hours are most sensitive to magnetic radiation from heated work surfaces and incubators. The DNA might be damaged at as low as 0.1 A/M magnetic field , while the magnetic flux inside incubators reaches levels as strong as 10 A/M. Until manufacturers will be more aware of that problem you can use a" Safety Box" that stops the magnetic flux and gives embryos a better chance to live. Bio-Safe shields embryos against the strong magnetic flux found in most IVF equipment. A major source of disease and contamination in hospitals and clinics lays in the air-conditioning systems and in the quality of air. Sore throat, red eyes, headaches, “lack of air syndrome" acquired diseases, are all part of the same problem. Airborne concentrations of microbes and nano particles pose a hazard both to patients and staff. In many hospitals this source of contamination looks like a new, unfamiliar science. A simple air sample usually reveals contamination that has been associated with human health problems in indoor environments. Base maintenance personnel have no regular access to provide periodic professional disease preventive maintenance (PM) on the hospital Heating, Ventilation and Air Conditioning (HVAC) systems. Periodical examination and tests for "IVF CLINICS"
1.6. VOC levels in compressed CO2. 2.5. measuring the differential pressure between the room and the surrounding relevant area. 3.4. evaluating the sterilization effectiveness of autoclave sterilizer and the way materials are being handled. 4.4. monitoring the quantity of positive ions in the air. These series of tests, which last no more than a few hours, provide a clear and accurate picture of the room and of the maintenance quality. There after one can determine what measures have to be taken in order to bring the room condition to an acceptable level. These series of tests determine the Room Grade according to the EN GMP. We can learn a lot from monitoring the air for small particles. 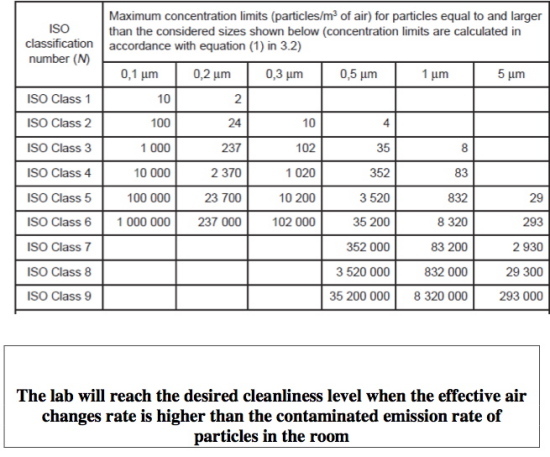 • In a new room: "particles’ counting" is required for an immediate feedback regarding the quality of the air system. • During renovation and maintenance monitoring should be repeatedly done to make sure that the job is improving the air quality and not vice versa. • During adjusting "air changes per hour", repeated "particles’counting" monitoring is to be done to regulate the optimum number of changes required. Class 7 : intensive care units, sterile material storage rooms, air locks and sterile corridors and rooms. 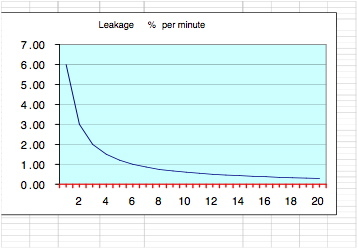 Keeping up the tightness factor dramatically improves the performance of medical clean rooms, improves the filtration process, the humidity and temperature control. When tightness is poor, every opening of the door, little cracks or holes cause a purge of contaminated air into the room. Standard tightness factor is reached in a room where pressure loss rate from 160 pascal to 60 pascal lasts more then 12 seconds . In this case the outside air penetration rate is smaller than 0.5 percent of the room volume in one minute and the filtration recovery system can cope with this amount of contamination and keep the room clean. Clean air should reach the operation field in the shortest and most direct way. It should not cross through equipment or stuff. It should always move in the room from up to down. Any other flow pattern might cause cross contamination. Positive ions in the air are a common source of stuff and patients’ complaints of head ackes, feel of lack of air, sore throat and running eyes. The sources of ions are the ionization devices that are sometimes part of the air filtration systems. • Without the ability to regularly monitor concentrations of particles in the air one cannot really determine when to change filters or if the room is a "clean" room. 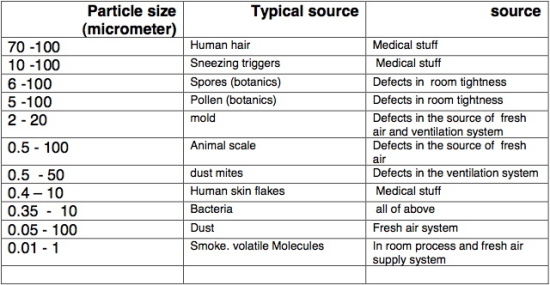 • The source for fresh air is critical to the quality of the clean room. Hospitals have a hostile environment and contaminated air. The source for fresh air should be from the highest point possible and far from all obnoxious toxic contaminated discharges emitted by other departments. • The HVAC system and tunnels are natural places for growing microorganism. They are the second most important cause for disease spread in hospitals. The first cause is the stuff itself. Decontamination measures should be done several times a year to reduce the risk. Ozone ( O3 ) in gas state is a highly effective decontamination means for the room surface and HVAC systems. The gas ozone reaches every little corner and crack that is unreachable or has been skipped by the cleaning team. 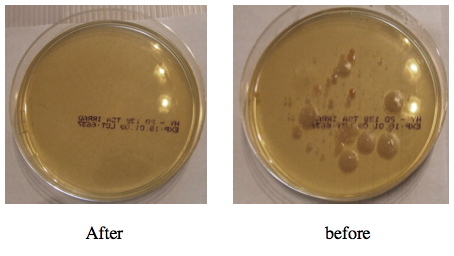 In the attached photos you can see the results of air samples for bacteria presence in the air before and after the ozone treatment . He holds an exclusive international patent for ‘Gas-tight Ventilation System’ and this, together with his many years of experience constructing gas-tight buildings, gained him the CTCB "PROFESSIONAL certification. 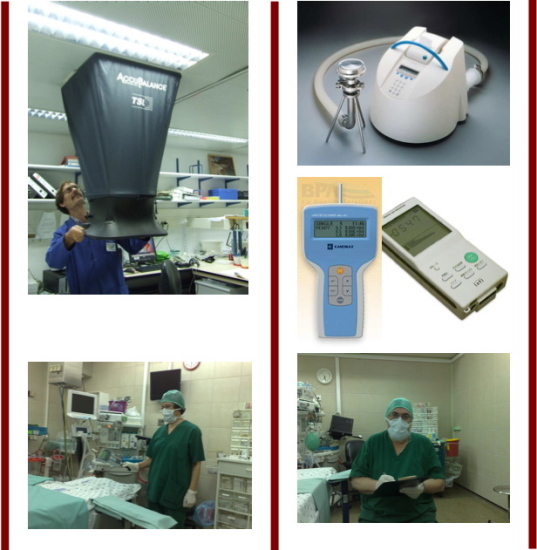 Mr. Lehmann applied his unique knowledge in the design and operation of ‘clean rooms’ to hospital operating theatres, IVF laboratories and isolation rooms throughout Israel. In fact he has set new standards in his approach to controlling and maintaining clean air – particularly with regard to the "Tightness Factor" parameter and the linkage between ‘Tightness and Air quality’. 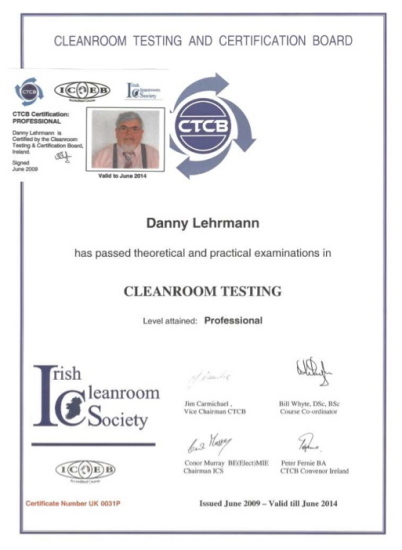 As a result of his experience and many innovations, Mr. Lehrmann was invited to represent his work at the prestigious ‘Clean-Room Contamination Control Technology’ conference recently held at the world trade centre in Boston, MA, USA.